Our general fascination with all things Jane Austen continues with this 2007 fictional glimpse into one short period of her life: that time when she was attracted to Tom Lefroy and would have formed an engagement if not for the objections of his family. I say fictional because the filmmakers have taken considerable license with what we understand as historical fact. This is something movies do all of the time, but with Jane Austen it is best to take special care because her fans are quite dedicated. It is a Sunday morning in 1795 in Hampshire, England. At the cottage of the Reverend George Austen (James Cromwell), youngest daughter Jane (Anne Hathaway), toils away at her writing while her sister Cassandra (Anna Maxwell Martin) and the others sleep. When the servants get to work, Jane begins to play her piano loudly to wake everyone up. Cassandra has just become engaged to Robert Fowle (Tom Vaughan-Lawlor) who must travel to the West Indies to earn his pulpit. The local grand dame, Lady Gresham (Maggie Smith) is resolved that her nephew, Mr Wisley (Laurence Fox) will marry Jane, despite her poverty, but Jane is much less certain. She desires to marry for love, not money, as is the custom. Meanwhile, in London, young law student Tom Lefroy (James McAvoy) drinks and carouses his way into the bad graces of his uncle, the Lord Chief Judge of the high court (Ian Richardson). Although he comes from a poor Irish family, his uncle is without heirs and Tom depends on the possible inheritance as the only way his family can survive. After a night of drinking, Tom arrives late to court and his uncle berates him for his lack of decorum. As punishment, and as a possible tonic for his Tom’s decadent lifestyle, his uncle sends him to the country to stay with relatives. Arriving bored and angry, his friend Henry Austen (Joe Anderson) invites him to attend a tea to celebrate Cassandra and Robert’s engagement. Jane reads a lengthy, comedic tribute to the happy couple, but later overhears Tom disparaging her writing. In a pique of anger, she burns her marriage tribute and questions her other writing. Henry, one of Jane’s older brothers who has just graduated from Cambridge, has also brought a priggish friend, John Warren (Leo Bill) to the party and he becomes smitten with Jane, although she finds his bumbling manner offensive. Tom’s relations include his cousin, young Lucy Lefroy (Jessica Ashworth) who has a crush on Tom and hopes to make a match with him. A member of the Austen party is Jane’s cousin, Eliza, the Comtesse de Feullide, who had been married to a French count, beheaded during the Revolution. She takes a shine to Henry and hopes that her wealth will provide a means for him to become an officer in the English Navy. Walking in the woods, Jane encounters Tom and they exchange uncivil words, but despite his criticism of her writing, Tom sees her intelligence and wit and is attracted to her. During an accidental meeting in the Lefroy library, he gives her a copy of Henry Fielding’s Tom Jones so that she can experience a more visceral form of writing. When they discuss the morality of it, he remarks that good people can come to a bad end, but Jane has already grasped the prime purpose of what a good novel should be. “A novel should reveal the true source of our actions,” she tells him. This is the heart of good fiction: action must be organic. Mr. Wisley finally asks to Jane to marry him, but she cannot in good conscience say yes to him. She doesn’t love him, although she is beginning to respect him. Her mother (Julie Walters) is very distressed by this refusal, but her father takes it more in stride. Even so, he is realistic about the world. “Nothing destroys spirit like poverty,” he tells Jane. But Jane wants to marry for love and gradually realizes that she loves Tom. At a ball, Lady Gresham confronts Jane, telling her explicitly that her nephew’s offer of marriage is the best that Jane can ever expect in her life and that she has a duty to her impoverished family to accept. Outside, by the fountain, she and Tom profess their love to each other and pledge that they will try to find a way to make it work. On the way to visit Jane’s older brother, Edward, Tom invites Jane, Eliza, and Henry to stay with his uncle in London, hoping that Jane will make a good impression, but at dinner, Jane contradicts the Lord Justice on the nature of irony and falls into disfavor. Unable to sleep, Jane begins drafting a new story, First Impressions, which turned out to be the first draft of Pride and Prejudice. Before Tom can tell his uncle that he wants to marry Jane, the Lord Justice receives a letter informing him that Jane is a penniless husband-hunter. He turns his back on them and Tom has only one option if he wants to inherit his fortune: he must abandon Jane. Directed by Julian Jarrold, the movie was filmed almost exclusively in Ireland, with assistance from the Irish Film Board, mostly because Hampshire had become too clean and modernized. It is a beautiful film, no doubt. The cinematography by Eigil Bryld brings the English countryside to life, even if it was filmed in Ireland. Trust me, you won’t notice the difference. The script, drafted by Sarah Williams and finalized by Kevin Hood, was based on a the book, Becoming Jane Austen by Jon Hunter Spence, uses some historical facts, but mashes everything up to create a good romantic film. The best of it provides terrific glimpses into influences on Austen’s writing, such as Lady Gresham’s remark that there is “a lovely-ish wood” nearby that Jane and Mr. Wisley could walk in or Wisley’s fragmentary remark that “it is a truth universally acknowledged.” Certainly Lady Gresham bears a striking resemblance to Lady Catherine de Bourgh and there is evidence that she used her own mother and father as models for Mr. and Mrs. Bennet. Jane’s relationship with Cassandra is compared to Lizzie and Jane, but they could also be Elinor and Marianne from Sense and Sensibility. The bumbling John Warren is very close indeed to Mr. Collins. All of this is extremely well done, if a trifle obvious in places. It is a witty and emotional script, very well written. However, if readers are seriously interested in Jane Austen’s life, I would recommend the biography Jane Austen: A Life, by David Nokes. This is an excellent book and is much more factual than the movie. The acting is first rate, especially the supporting cast. James Cromwell and Julie Walters as Jane’s parents are terrific, as are Maggie Smith, Ian Richardson, and Anna Maxwell Martin. Helen McCrory is remarkable as Mrs Radcliffe, the author of The Mysteries of Udolpho, whom Jane meets on her stopover in London. James McAvoy brings a lot of soul to Tom Lefroy, elevating him far beyond the carousing rascal he starts out as, into a man who must carry his own pain with him throughout his life. But the movie is centered around Jane Austen and Anne Hathaway’s performance is critical to the movie’s success. I have read that many English critics have found fault with her English accent and others are affronted by the fact that she is American and not English. These things did not bother me. And I found her performance to be very strong and very affecting. She amused me and moved me and must be accorded as giving a very good performance. My only issue is personal. I have a certain view on Jane Austen that has been fostered by my own reading, by my study of her biography, and by the one picture that seems to capture her essence. I think her weight was an essential part of her character, that her own roundness helped to reveal who she was. Hathaway is thin, she looks harshly angular and skinny and despite her truly remarkable performance I simply could not accept her as Jane Austen. Perhaps this is a failing on my part, but I would have much preferred to someone a little closer to Jennifer Ehle, who played Elizabeth Bennet in the BBC Pride and Prejudice. I was also a little irked by the historical inaccuracies. For one thing, Jane Austen was incredibly well-read and was certainly familiar with Fielding’s Tom Jones as a classic of the times. I also found it troublesome that she would consider eloping with Tom Lefroy. 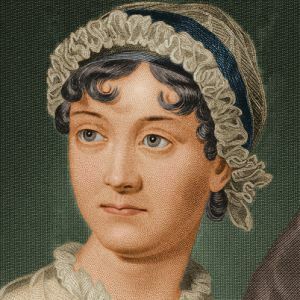 Austen was a girl of her times and would not pull a Lydia Bennet. Their daft brother, George, was secreted away and the family never saw him, yet here he is included as if they saw him every week. These are, of course, minor objections in a movie that largely succeeds and makes a worthy addition to film canon of Jane Austen. Everyone who is deeply into Austen should see the film and make up their own minds. For my part, I liked it in spite of myself. I was moved by both Jane and Cassandra and I loved their relationship. It is probably quite close to their real relationship and is very moving. Overall, I found the movie to very affecting and I must recommend it.